Have you ever wished you could sing a prophetic song, or that you could release prophetic worship in your prayer meeting or church service? Sometimes people get intimidated by prophetic worship because they confuse it with spontaneous worship. Then they put a lot of pressure on themselves to conjure something up. If it doesn’t flow very well, the result is awkward worship … and you might get discouraged if your effort turns out awkwardly. The good news is: ALL of God’s people can prophesy! 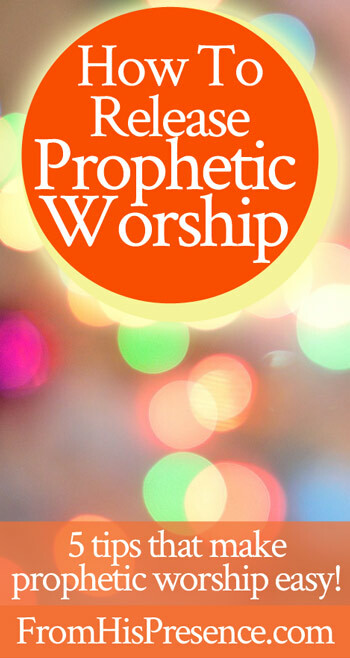 And releasing prophetic worship is easy when you remember that the “prophetic” part makes up 50% of the phrase! This vlog is 28 minutes long. In it, I teach 5 keys that will not only help you with prophetic worship, but also will help you flow in prophecy of any type. These tips will enhance your worship life whether you are on the platform or in the congregation! By the way, see my blog post here about How To Win In Spiritual Warfare for practical tips about releasing the testimony of Jesus during worship. After you watch, I’d love to hear from you! Do these tips help encourage you that you, too, can release prophetic worship? Please leave a comment below! Jamie this is incredible,I love this may the Lord continuosly bless you.